If the prize is worthy, a man'll undertake the most arduous of quests, whether it's slogging across nine states to buy a 1970 Firebird, or slogging through nine recently vacated Mario Bros castles to get to the Princess...in another castle. For the grandest prize of all -- exotic beers! 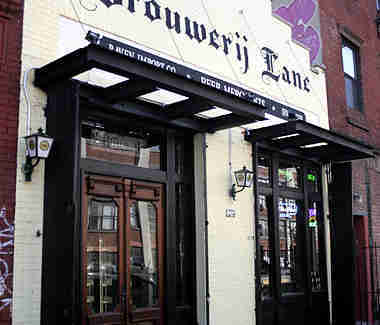 -- get to Brouwerij Lane. A woodsy boutique with a fresh cedar-burning antique stove, BLane peddles 400+ hard-to-find suds brands, all brought together by a 20+ year Brooklyn Brewery vet who chose Greenpoint as the terminus of a spiritually reawakening, liver-killing Hajj. 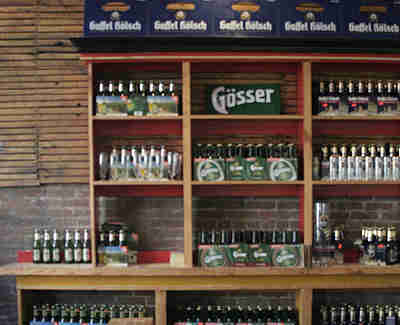 Rare bottles are displayed Matrix gun rack-style, running from NY micros (Ommegang, Sixpoint, etc), to Polish and Germans (Warka, Zywiec, Malheur champagne-beer), to Belgian brands like Tripel Karmeliet and Pauwel Kwak -- traditionally served in a "yard of ale" glass that's hourglass-shaped with a round bottom, just like the men who drink it. 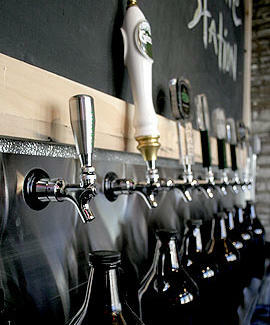 Because every man's his own best bartender, BLane also hawks $10 growlers fillable with any of ten taps, from Germany's Gaffel Kolsch, to Belgium's Gruut, to Jever Dark, which is never sold in bottles in the U.S., except when it's sold on tap, and then bottled. BLane's open for biz now, but they're throwing an opening party this Saturday and offering free tastings from their taps -- a worthy prize for buyers and Bowsers alike.